Members of the Sinn Fein party on Tipperary County Council have walked out of todays meeting of the local authority following very heated exchanges during a discussion on the constituency boundary changes involving Cahir, Clonmel and Cashel. The exchanges became very heated when Cllr Michael Fitzgerald (FG) and Cllr David Dunne (SF) clashed and as tempers became frayed with others getting involved, acting Chairman, Cllr Michael Murphy adjourned the meeting for five minutes to allow for a cooling off period. When the meeting resumed Cllr Fitzgerald said that he is the longest serving member of the council and has always treated officials and members alike with respect. He regretted greatly if Cllr Dunne felt he was mocking him, he said, but added that SF members cannot go jumping down his throat and interrupting him every time he gets up to speak. He did not appreciate SF members behaviour at all and referred to a comment passed to him at a previous meeting which he found “disgraceful.” He is not, and never has been a bully, as he was accused during the heated exchanges. Cllr Catherine Carey jumped to her feet describing Cllr Fitzgeralds comments as “a lame excuse for an apology” before order was restored by the Acting Chairman. Cllr Martin Brown, spoke on behalf of SF and also described the apology as being “lame”. And, he informed the CEO that he had a responsibility as their employer to ensure that members are protected and not subjected to being mocked and sneered at. He informed the members that SF was leaving the meeting and together with Cllr Dunne and Cllr Carey, they departed. 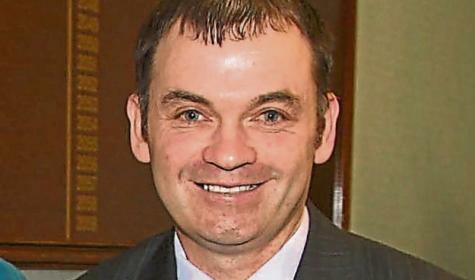 Cllr David Dunne pictured above.